We are a small "U" shaped park. We have 25 spaces. All with full hook ups and all have 50 amp service. We can and often do accommodate several up to 40’+ units. 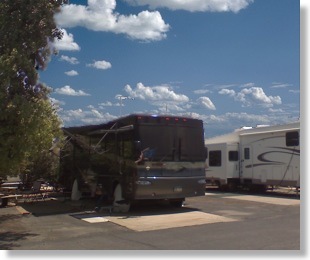 Unlike most all of the small parks in the area that are really "Trailer Parks" calling themselves RV Parks. 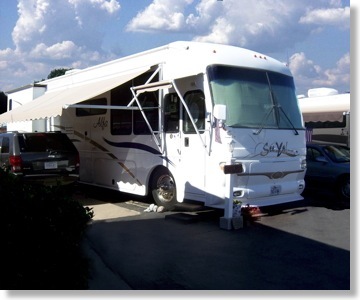 We “ARE” an RV Park catering 95% to senior snowbirds, and winter travelers. Most of our guests are here 4-6 months in the winter. Very many return often. We do not have the amenities of the larger parks that surround us, BUT we charge accordingly. Most of our guests stay here because they do not want to pay hundreds more a month for extras like dance halls, bingo room, and wood working. Most would rather spend their money on things THEY want to do, like shopping, golfing, restaurants, or just enjoying themselves. Our guests feel safe and comfortable because of the people that stay here. Something that is very important to most snowbirds. SnowBirds don’t want to be in a trailer park with messed up people on both sides of them. Most want to be around people like them that have worked most of their lives and are now able to take some time and enjoy themselves. We welcome small Furry Children, (the only kind of children we take) and indoor cats. But will consider any size Furry Child that is well behaved and in no way bothers other guests. (The same thing we require of all our guests. Both 2 and 4 legged.) I cannot express how annoyed winter visitors get when they have to listen to a barking dog next to them, so we just don’t allow it. A Utility Surcharge, MAY apply to Daily and Weekly depending on the Month, Temperature, & RV Size. Many Parks in This Area: Many parks in this area Charge up to $35.00 for WiFi, (Which in many cases only works good near the office.) Many are now charging $30 a month for pets, (We think furry children should stay free,) and many parks charge a rate for Electric that is much more than they pay. Several parks right around us are charging a trash charge, even though you still have to take it to the dumpster. It all adds up, and adds on to the price they initially quote you. Our guests would rather stay at our smaller park, and use the money you save, for restaurants, golf, shopping, and other recreation! 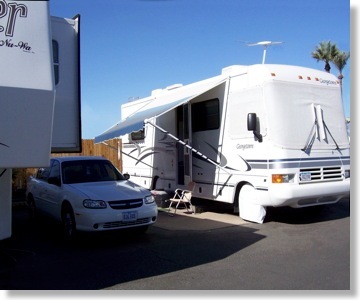 We May or May-Not allow, on a case by case basis,,, Class B, Campers, Pop-Ups, Very Small RVs, Older RVs, a Second Car, guests Without Cars, or guests wanting to use our Restrooms*. We typically do not allow Motor Cycles, anything nonstandard, old, or in bad repair. ( Both RV or Automobiles. ) Check with us in advance if you have any doubts. We are always willing to discuss it, and might make an exception if the circumstances are right. 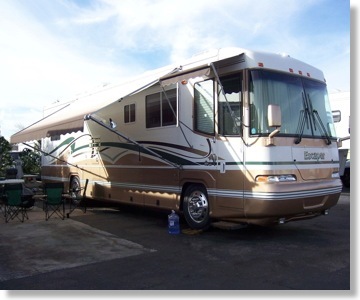 Like and older RV that looks newer, or is a custom restore. All rates are for two (2) people. Additional guests must be pre-approved and may substantially increase the rate. * While we have very nice Restrooms,,, in 2015 we decided to no longer take guests wanting to use our facilities. This is just our personal choice. 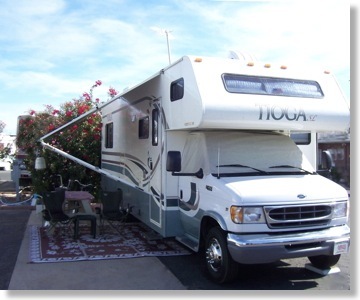 Since we don’t take older, or very small RV’s, this should not be an issue for any of our guests. They are available however, for a guests with plumbing emergencies.